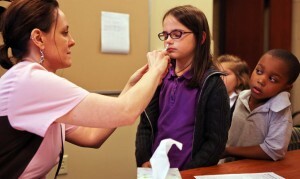 Akron Children’s began offering the flu vaccines in nearly a dozen schools, making it easier and more convenient than ever to get children immunized. On Tuesday alone, about 2,000 Akron Public School children were immunized. The rest of the district was being covered today and tomorrow.